On the afternoon of April 12, 2019 local time, Premier Li Keqiang met with Prime Minister Zoran Zaev of North Macedonia in Dubrovnik. 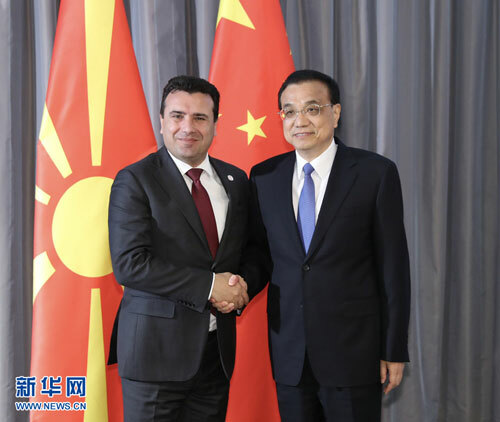 Li Keqiang expressed that the Chinese side and North Macedonia respect and trust each other, and that practical cooperation between the two countries has yielded fruitful achievements. The two countries enjoy sound bilateral relations. We are willing to dovetail the Belt and Road Initiative with North Macedonia's development strategy. Highway projects are a landmark for bilateral cooperation, which is of great significance to North Macedonia's social and economic development and regional connectivity. We stand ready to work in close coordination with North Macedonia to promote cooperation in transport infrastructure construction for greater achievements. It is hoped that North Macedonia will provide convenience for advancing the highway construction. Zoran Zaev said that North Macedonia and the Chinese side enjoy sound relations and cooperation as well as close high-level exchanges. Cooperation between Central and Eastern European Countries (CEEC) and China has vigorously boost North Macedonia's social and economic development. North Macedonia has benefited from China-CEEC cooperation and the connectivity projects with positive radiating effect. North Macedonia stands ready to work with the Chinese side to deepen cooperation in trade, investment, energy, agriculture and infrastructure, to push bilateral relations for greater development.